As a fledgling cook, it can be very easy to get caught up in using very similar ingredients all the time. Lord knows there's a lot of versatility in a pound of shrimp, some onions, garlic, tomato and limes. As previous entries will attest to! Pickling is dead easy: trim the stalks if this hasn't done yet to keep only the white bulb (ignore the red bits in the pic above), mix equal parts vinegar and water, throw the garlic in the solution. Keeps for about a month. 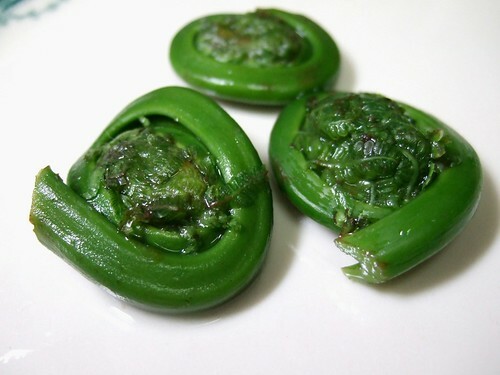 Fiddleheads are a Central-Eastern Canadian/Northeastern U.S. delicacy. They're a kind of fern (ostrich fern) that grows in the early Spring. Other varieties can be found throughout the world, but I've never heard of them used outside the northeastern N. American seaboard. Pan-fried in butter as a side for a nice piece of fish? Welcome to Heaven! The flavour is quite unique, and you need to wash them thoroughly before cooking in order to remove the brown leaves as they are/might be toxic. Cooked fiddleheads are still pretty crunchy. The flavour is reminiscent of broccoli, but milder. Peak Season: late-April, May (Ottawa area - this year the availability started and ended weeks earlier due to a mild winter). OK, I'll be the first to admit that stir-fry, while being the easy choice for quick meals, can get pretty effing boring after the umpteenth shrimp or chicken dish. So, when I was in Chinatown (which in Ottawa is more like Chinastreet) recently, I came across this interesting looking package labelled 'Chinese sausage'. Now sausage is one of the best foods in the world no matter where it comes from, but Chinese sausage (aka "Lap Cheong") is something totally different than what we're used to. Honestly, they kind of look like pepperettes. But the flavour is this interesting mix of sweetness, smoke, licorice and salt. And the texture is much harder and chewier than normal sausage, but it is dried and keeps much longer than regular sausages. Serve over hot rice or noodles with Sriracha hot sauce, if desired. Chinese sausages and Sriracha are available at most Oriental grocers and supermarkets. Alright, maybe it's not super-exotic, but I LOVE pickled herring. Try it some day with some really nice toasted bread. You can find jars of pickled herring at any supermarket in the seafood section. This is my secret weapon for cooking spicy food. I use it in dry rubs, I use it in BBQ sauce, I put it on my toast, I use it in chili instead of chili powder. I'm like the old lady in those Frank's Red Hot ads. Berbere spice is a staple in Ethiopian cooking. 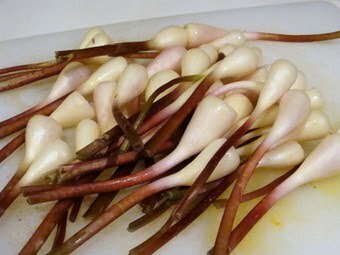 It's used in stews like Doro Watt and most other common dishes. The version I use was taken and slightly adapted from Chef Marcus Samuelsson's The Soul of a New Cuisine: A Discovery of the Foods and Flavors of Africa. This is a GORGEOUS cookbook with lots of shots of the locals in various African countries doing their thing with food. And it has some neat-o recipes. I adapted his BBQ sauce recipe for ribs the other week and, yeah, wow. But it's Samuelsson's simplified Berbere recipe that has made buying this book totally worth it. Here is the recipe, not sure what the copyright law is, but I'll repeat: this is Chef Marcus Samuelsson's recipe, from Soul of a New Cuisine. Please don't sue me. If you have trouble finding the ingredients, check out an Indian grocery and a Chinese grocery. Between the two, you should find what you need. Use it liberally the way you would chili or curry powder. Mix about 2 parts brown sugar with 1 part Berbere spice for a delicious rub for meat. So, zataar, what is it? Well zataar itself is an herb blend. Often the herbs are mixed with oil to create a spread. I've only ever had it prefabricated from Boushey's Grocery - essentially what they make is a pita bread with this spread over it. They sell it for about 1.50$. It's a tasty, tasty snack! Here is a recipe for the zataar spice blend from about.com. I have no idea about the authenticity, but I bet you it's tasty! Grind the sesame seeds in food processor or with mortar and pestle. Add remaining ingredients and mix well. 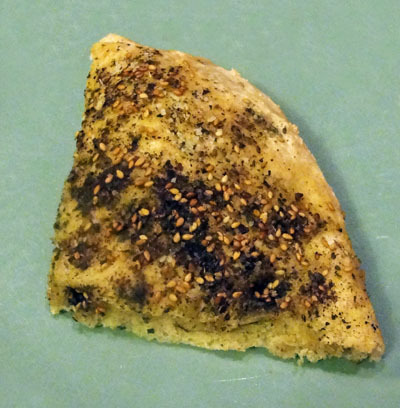 Store za'atar in a cool, dark place in a plastic zip bag or in an airtight container. When stored properly, za'atar can be used from 3-6 months. To make into a spread, add olive oil a bit at a time, stirring constantly, until desired consistency is reached. Spread it on pita bread and enjoy the bitter deliciousness! 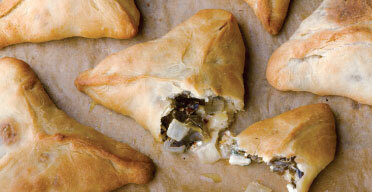 Fatayer is a kind of savoury pie/turnover dealie, usually stuffed with spinach, onion and any number of spices/herbs. It's commonly sold in Middle Eastern groceries. Makes great picnic/hiking fare! In a medium bowl, combine flour and salt. Add oil and begin to knead dough. Once oil is absorbed, add warm water. Knead into an elastic dough. Shape dough into 2 inch diameter balls. Cover and set aside. Place 2 teaspoons of filling in the center of each ball of dough. Cover filling with dough and form into triangular shape. Bake for 10-15 minutes on greased baking sheet, until golden brown. Allow to cool 5 minutes and serve immediately. That's it for this edition of 'off-the-beaten path' foodstuffs. I'll get back to this topic when I've gathered enough to make it worthwhile. As always, your comments are welcome too! Good day dudes and dudettes! Alright, I've been shoving BBQ and meaty goodness down your throat over the past few posts, so now it's time to switch gears and lighten the mealtime load. The following recipe was cobbled together for a certain lady friend who had no idea what to have for dinner (a fairly common occurrence, eh kitten?). After she tried it, she said it was good, so I figure I might as well share. Whisk ingredients together with a fork. Serve in salad bowl with good quality pita bread or baguette. Yeah, we all love 'em, they're delicious messy pig awesome. Now, making ribs the 'pure' way is about as far from 'easy bachelor cooking' as it gets, but there are ways to cheat. I like to smoke my ribs, but it involves having a smoker or making a smoke packet, all of which are far more complex than necessary to make a whack of "DAMN that's good" ribs. For now. Soon, teach you smoking I will young Padawan, hmmmmm... Yeah, cause I did my first smoke job a few days ago and I all I can say is GODDAMN! Step 1 - Get some ribs. Side ribs are cheaper, and you don't have to remove the membrane that you do for back ribs. Granted they aren't as tender, but for this trial, let's stick with side ribs. Step 2 - Get some cheap BBQ sauce for the marinade/pre-cook. Kraft Garlic works just fine. Mix this all together in the food processor or whisk together with the BBQ sauce & onion/garlic puree. Step 5 - Using a roasting or lasagna pan, lay out the ribs and pour sauce over them, rub the sauce into the meat. Make sure the meat is all well covered. Step 6 - Cook ribs in oven for 4 hours at 200 degrees Farenheit. Step 7 - Increase heat to 240 and cook for another hour. Remove from marinade. Ribs should be close to falling off the bone, but that isn't guaranteed. And really, they're still DAMN tasty. Step 9 - Brush ribs with higher quality BBQ sauce. Remember the PC Smokin' Habanero Barbcue Sauce from last time? Yeah, that stuff works nicely if you like the spicy. If not, I suggest Diana sauce of whichever variety. Step 10 - Cook ribs until sauce glazes and forms a crust of sorts. Do this on both sides. You can do this as much as you want. Usually 3 'coats' of sauce is good, but it's a question of taste. Step 12 - Keep lots of napkins handy and EAT! Chances are, if you were born before 1985, you probably remember the advent of fajitas in the late 80s as THE COOLEST FOOD EVER! Who doesn't have a fond memory of going to one of many brand-new Tex-Mex joints in their neck of the woods (readers from south of the Mason-Dixon line, please ignore this) and being bombarded by the smell of meat sizzling on super-hot metal plates that they served in front of you with all the cool fixins on the side? And then you got eat that goodness with your hands! YEAH! 13-year old me is PLOTZING just thinking about it! My mother would continue the tradition at home with nearly the same amount of spectacle. And a ton of clean-up for the kids aferwards (fajitas at home = mixed blessing!). Now, as time has passed, I've found myself craving that awesomeness, but do I have the room or implements to make that kind of meal? HECK NO! But, as with any good cook who has limited space, time and resources, I tinker. So, after a few attempts, here's my take on fajitas. Basically this recipe takes all those different ingredients that you put on a bunch of different plates and cook differently and puts them altogether. It also is a year-round recipe. No grilling involved. - Whisk all sauce ingredients together. - In a large frying pan on medium-high heat, pour in Fajita sauce, meat, peppers and onion and sauté. You can add the tomato if you like it cooked (I do it this way) or keep it aside if you want to add it raw. - Fry up mixture for about 15 mins until everything's cooked. - As mixture is cooking, place as many tortillas as you're using on cookie sheet and preheat oven to 350 F.
- Spoon mixture onto tortillas and roll into cylinder. - Remove from oven, open fajitas and spoon sour cream, salsa, guacamole, chopped cilantro, etc. etc. - how ever you want it! - Eat and get messy! Psssssst... You want a recipe for guacamole? DEAD easy! - Add all other ingredients and mash with a fork until desired consistency is reached.